The Doors' Keyboard Counterpoint Goes Silent : The Record Raised on the South Side, Manzarek brought Chicago sound to L.A.'s beaches with the trailblazing band. He died Monday at age 74. 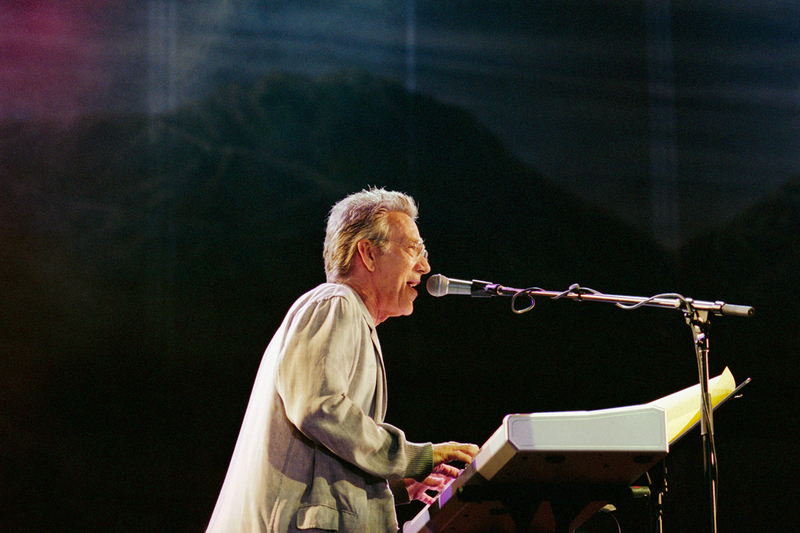 Ray Manzarek, performing in 2002. Manzarek, who died on Monday, reunited with The Doors' guitarist Robby Krieger more than 30 years after the band's lead singer, Jim Morrison, died. Ray Manzarek, the founding keyboardist of the Los Angeles rock band The Doors, died in a clinic in Germany on Monday after a lengthy battle with bile duct cancer, according to his publicist. He was 74. Born Raymond Daniel Manczarek Jr. and raised on the south side of Chicago, he resisted piano lessons when he was young, until he heard Chicago blues and jazz on the radio. In 1965, he formed The Doors after moving to Los Angeles and meeting Jim Morrison. "We were aware of Muddy Waters. We were aware of Howlin' Wolf and John Coltrane and Miles Davis," Manzarek told WHYY's Fresh Air in 2000. Manzarek brought the Chicago sound to L.A.'s beaches, and The Doors added beat poetry and psychedelic drugs to rock 'n' roll. "As the sun is setting into the Pacific Ocean at the end, the terminus of Western civilization, that's the end of it," Manzarek said. "Western civilization ends here in California at Venice Beach, so we stood there inventing a new world on psychedelics." The group became well-known for Morrison's magnetism and volatility. Drummer John Densmore says Manzarek recognized Morrison's talent for words. "He saw in Jim the magic before anyone," Densmore says. He also figured out how to add something new to the band. "We didn't have a bass player, which is really against the rock 'n' roll rules, but we found this keyboard bass. And so Ray's left hand and my drumming were ... cooking up the groove for [guitarist] Robby [Krieger] and Jim to float on top of." Manzarek pulled double duty: Not only did he provide half of the rhythm section, but he played melodies too. "I had a keyboard bass sitting on top of a Vox Continental organ," he told Fresh Air in 2000. "The Vox Continental organ was what I played with my right hand and the Fender keyboard bass with my left hand." It was Manzarek's interpretation of Bach — with that right hand — that launched The Doors' first hit, "Light My Fire," in 1967. "That was like a giant hook," Densmore says. "Schools of fish bit that. Ray's keyboard licks will go down in history as the most memorable hooks you could never forget." His keyboard playing would drive many classic Doors songs, like "Riders on the Storm" and "Break on Through (to the Other Side)," but just four years after "Light My Fire" hit the top of the charts, Morrison was dead. Manzarek, Densmore and Krieger tried to continue, recording two albums with Manzarek singing some of the lead vocals, but eventually called it quits. Manzarek recorded several solo albums, collaborated with poets and produced for other groups, including X, another Los Angeles trailblazer. In 1998, Putnam published Manzarek's autobiography to critical acclaim, though Light My Fire: My Life with the Doors, was more about Morrison than Manzarek. He also wrote two novels. And in 2002, he reunited with Krieger to play The Doors' songs live. But he maintained that his identity was formed in Los Angeles with his three bandmates nearly a half-century ago. "Once you open the doors of perception," he said, "the doors of perception are cleansed, they stay cleansed, they stay open, and you see life as an infinite voyage of joy and adventure and strangeness and darkness and wildness and craziness and softness and beauty." And Ray Manzarek leaves all of that behind in his music.